There were movie stars and supermodels, TV hosts and pop stars. 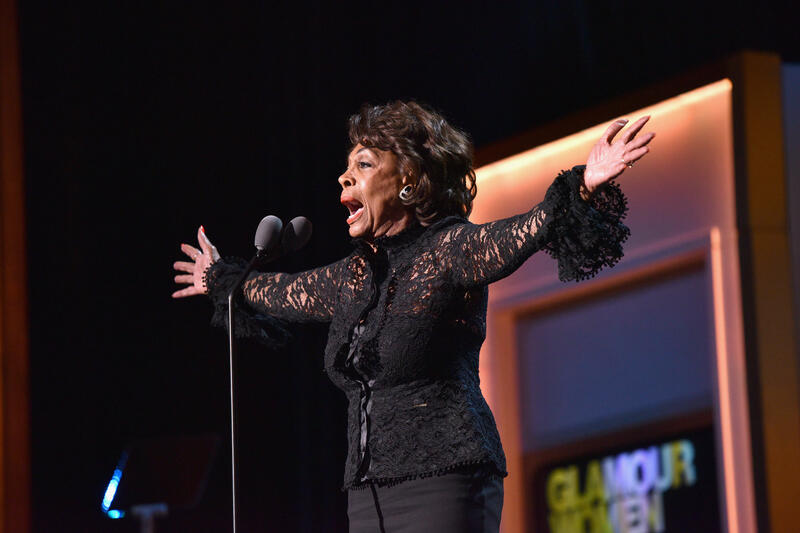 But perhaps the most rapturous ovation at Glamour magazine's annual Women of the Year awards went to 79-year-old Democratic U.S. Rep. Maxine Waters of California, who delighted the crowd — including hundreds of cheering young girls — with a rousing speech that ended on a very political note. "Impeach him," she exhorted the audience. "Impeach 45! Impeach 45!" Alongside Waters, honorees at Monday evening's ceremony, held at a theater in Brooklyn, included actress Nicole Kidman, singer Solange Knowles, late-night host Samantha Bee, model Gigi Hadid, film director Patty Jenkins, and fashion designer Maria Grazia Chiuri of Christian Dior. Also honored were record-setting astronaut Peggy Whitson, Syrian refugee and UNICEF ambassador Muzoon Almellehan and the many organizers of the January women's marches. Though this was the 27th year of the Glamour awards, there was a different sensation this time around, noted Cindi Leive, Glamour's outgoing editor-in-chief. "There's a feeling in the air," she told the crowd at the beginning. She didn't have to explain that she was referring to the Harvey Weinstein sexual harassment scandal and the subsequent cascade of allegations in Hollywood and elsewhere, with both women and men coming forward to accuse powerful men of sexual harassment, assault or misconduct. "This is a singular moment for women," Leive said. "I am so glad that we get to seize it." One of the most powerful moments in the ceremony came when the two New York Times reporters who broke the Weinstein story — Jodi Kantor and Megan Twohey — took the stage to introduce a quartet of women who had experienced sexual harassment or assault. The first to speak: Anita Hill, who has been a symbol of the fight against sexual harassment ever since she testified in 1991 against then-Supreme Court nominee Clarence Thomas. She hadn't gotten the result she wanted back then, she explained — Thomas was confirmed anyway — but in just a few years, official complaints of sexual harassment skyrocketed. "I saw that we had a chance to shift the narrative," Hill said. Also appearing was Olympic gymnast Aly Raisman, who came forward last week to allege she was sexually abused by a U.S. team doctor, Larry Nassar, who has been accused by more than 100 women and girls of sexual assault. "We need answers," Raisman said. Kidman, accepting her award, noted it had been "an extraordinary year — we're in uncharted territory right now." But she said she preferred to celebrate "all of us, and what makes us, us." She thanked her parents, and then noted that she had "an extraordinary husband," singer Keith Urban. "As much as I'm a strong woman, I need help and I need support," she said. Along with the honorees, there were plenty of high-wattage presenters: Serena Williams, for example, came to introduce her friend, Hadid, noting that the supermodel was one of only a very few people that could get her to leave her new baby, even for one night. Drew Barrymore introduced Bee, and original Wonder Woman Lynda Carter introduced "Wonder Woman" director Jenkins. Singer-actress Zendaya, 21, introduced Waters, who clearly had fans among the young women from various girls' organizations seated up in the balcony. Waters told them that she didn't just want them to vote — she wanted them to become politically active. "I want you to do everything you can to get ready to run for office," she said. Also exhorting the young women to action was astronaut Whitson, 57, who returned to Earth in September after 288 days in space. In all, she has spent 665 days in space — a record for a U.S. astronaut. "I started as a farm girl in Iowa," an emotional Whitson said. "I dreamed of being an astronaut and an explorer, and I made it." She told the young women that it had taken 10 years of trying before she finally was accepted in the space program. Leive, who announced in September that she was leaving Glamour after 16 years, said at a dinner following the ceremony that she had never seen women as energized as they are now, with the current, expanding conversation on sexual misconduct by powerful men. "Something has shifted in the very molecules in the air," she said.